When I was a kid, I loved the Sisterhood of the Traveling Pants books. I mean loved. My friends and I read the books together in middle school and I don’t know about them, but I always longed to have a pair of pants to share. Instead we settled for sharing the book. Close enough, right? Well it has been ten years since I first read those books and fell in love with Tibby, Bridget, Lena, and Carmen, but I finally have the chance to have a traveling… something. 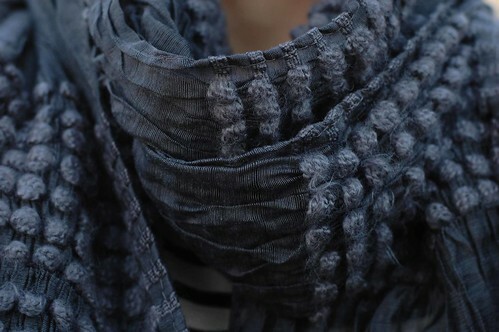 A scarf! I work with some scarf-tastic ladies who just happen to (also) have a tingly nostalgia for those books from our teenage years. (They say we are the nostalgic generation right?) 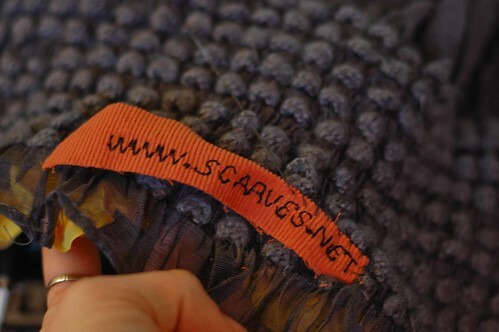 So we decided to start the “Sisterhood of the Traveling Scarf”… with a bit of 21st-century Internet flair. 1. You can keep the scarf for eight days. 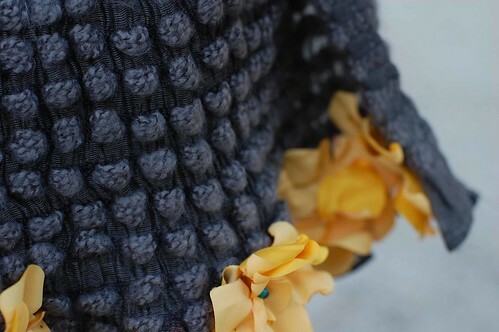 The scarf must then be passed on to a fellow blogger you deem crafty, fashionable, and all-around fabulous. 2. 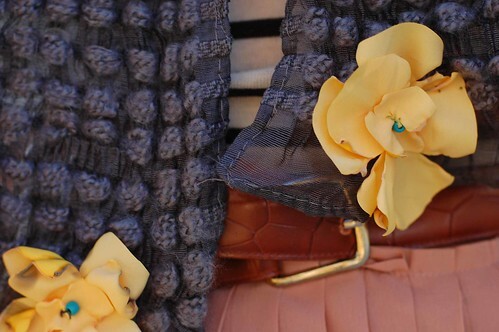 During your eight days, add a small and crafty decoration to the scarf. Be tasteful. Be clever. Make sure it represents you. 4. 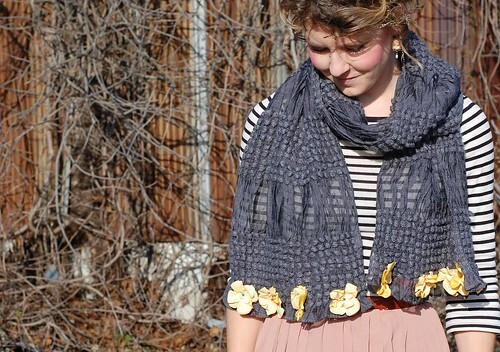 You must share your adventures with the scarf on your blog. 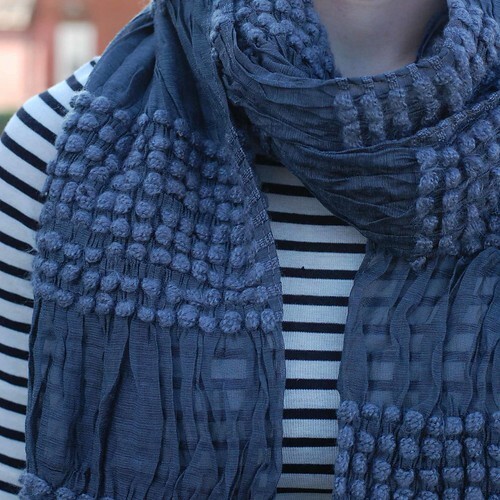 Show your best photos, talk about what you added to the scarf and why. 7. 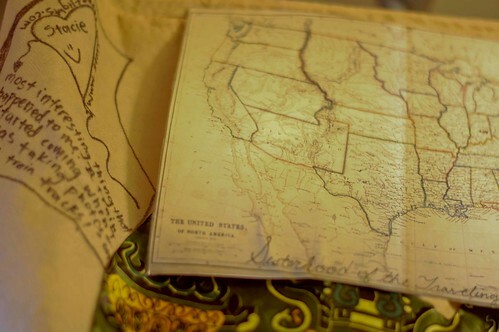 You must track the scarf’s journey on the enclosed map. Put a dot on your hometown with your initials. Add a trail from where it came from to where you are located. 8. You must write on the Sisterhood of the Traveling Scarf’s bag detailing the most exciting thing that happened to you while wearing the scarf. Want to know what happened to me? I was taking that photo above, and a TRAIN started coming. A TRAIN! Trains never come! What the heck? I was just fiddling with my tripod and then I looked up to see lights about a half-mile away. I scurried off those tracks super fast. 10. No showering in the scarf. (No microwaving of le scarf either.) Hehe. Remember: Scarf=Love. Love your pals. Love yourself.